See the program, and hear the Gerald D. Schmidt Memorial Lecture given by Dr. John Janovy Jr. 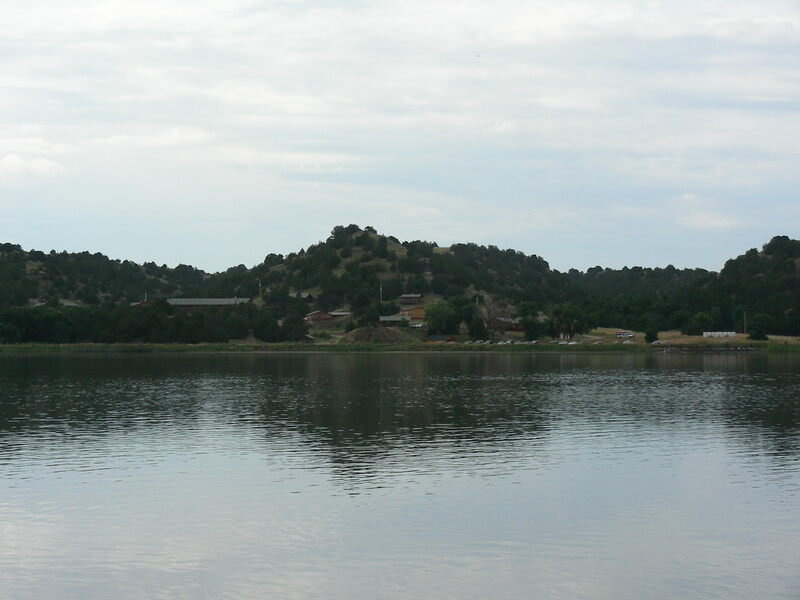 Located on the south shore of Lake Ogallala about eight miles northeast of the town of Ogallala, Cedar Point is situated near the center of Keith County in beautiful western Nebraska. Just "up-stream" from Cedar Point is Lake McConaughy; the largest body of water in Nebraska and its sandy beaches. For those traveling by automobile, Interstate 80 provides access from the east and west, Arrive at the meeting site on the Cedar Point campus, by traveling Interstate 80 West or East to Exit 126, For Ogallala. Head east on US-26-BYP/US 30 toward US 26 and continue to follow US-30. Turn left on E a St/US-26 W and continue for 0.4 mi, then turn left at E 8th St/US-26 then turn right at N Spruce St/US-26 and continue to follow US-26 for 2.1 mi. Turn right at NE-61 heading east and continue for 5.6 mi. Turn right at Central District road and follow Central District road for 0.6 mi until you come to a fork in the road by the hydro plant at Lake Ogallala. Take a right and continue until you come to the Cedar Point White Gate. You will have to unlock the gate enter the Cedar Point property and drive for another 0.5 mi until you reach the field station (see map). The Goodall Lodge will be the site for the Thursday evening reception. Friday and Saturday meeting sessions will be also held in Goodall Lodge, whereas the poster session will be held in the Gainsforth Resource Center. For those traveling by air, the closest airport to Cedar Point Biological Station is located at North Platte, Nebraska about 60 miles east of Cedar Point (North Platte Regional Airport). The North Platte airport is served by Great Lakes Aviation (1-308-532-1558) which offers flights from and to Denver. North Platte Airport Car Rental are available from Avis (308)-532-8014 and National (308) 532- 3766. For more information contact the official North Platte Airport website (http://www.northplatteairport.com/). Cedar Point Biological Station has faculty and graduate student units with air conditioning and bathrooms and student cabins with no air conditioning and a shared bathroom for men and women. All the beds are twin beds, so guests need to bring twin sheets and/or sleeping bags, pillows and toiletries. The following rates are quoted below. Alternatively if staying at the field station is not your thing, Kingsley Lodge (308-284-2775) is located 10 minutes from the field station rooms are available for $69.00 plus tax per night. Thursday evening sandwich dinner (optional), Friday breakfast, lunch and dinner, and Saturday breakfast and lunch (optional) will be provided at Cedar Point Biological Station. The following rates are quoted below. 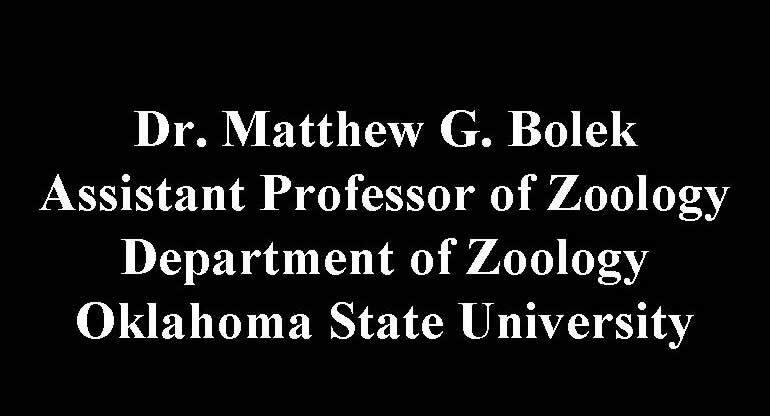 Matthew Bolek, Department of Zoology, Oklahoma State University, 430 Life Sciences West, Stillwater, Oklahoma, 74078 or bolek@okstate.edu. Abstracts are preferred to be submitted as an attachment in Microsoft Word or Corel Word Perfect. If you submit an abstract electronically, please include the information requested at the top of Abstract form. The DEADLINE for receiving abstracts will be Friday, September 5th. LENGTH of PRESENTATION--Scheduling will allow for oral presentations to be 15 minutes in length. There will be a few minutes after each presentation for questions. Longer presentations can be scheduled if you notify me at the time you submit your abstract. A-V EQUIPMENT--We will have a microphone equipped podium, a 2 X 2 slide projector, an overhead projector, a TV/VCR, and a computer projection system available for your use. If you need equipment not listed, please specify your additional needs when you submit an abstract. POSTER SESSION: Those presenting posters should plan to set them up on Friday morning before the start of the meeting. Guidelines for posters are given on the next page. STUDENT AWARDS: The Datus M. Hammond Award will be presented for the best paper by a graduate student, and the William C. Marquardt Award will be presented for the best paper by an undergraduate student. There will also be separate awards for the best poster presented by undergraduate and graduate students. ABSTRACTS: Abstracts must be submitted for both oral presentations and poster presentations. 1. The entire abstract-- including title, author(s) and institution(s)-- should fit within a space no larger than 4 inches by six and one half inches wide. 2. Type the entire title in capital letters, and italicize generic and specific names. Author name(s) and their affiliated institution(s) should follow the title. If papers are jointly authored but different institutions are represented, each author should have the name of his/her institution immediately after their name. Capitalize only the first letters of the authors names and institutions. You may include department, laboratory, or division names along with your institution, but do not include professional titles or the city and state unless they are a part of the institution name. If a paper has more than one author, designate the individual that will present the paper with an asterisk. 3. Double space between the title/author heading and the text of the abstract. Begin the abstract text at the left hand margin, and do not divide the text into paragraphs. 4. Use a good quality printer to reproduce your abstract, and be sure to carefully proof read it. All abstracts will appear in the program as submitted. GASTROINTESTINAL PARASITES OF BIGHORN SHEEP IN WESTERN MONTANA AND THEIR RELATIONSHIP TO HERD HEALTH. David E. Worley* and Floyd M. Seesee, Veterinary Molecular Biology Laboratory, Montana State University. Minimize the text. Use drawings, photographs, graphs, and tables to convey your message. Use lettering and images that are easily viewable from at least three feet away. Use a matte finish for photographs to minimize glare.